Sixtieth anniversaries of controversial issues in history are a good time to make up one’s mind about what really happened and, perhaps, let bygones be bygones. Several months ago, Athens, and Greece as a whole, marked the passing of the sixtieth year since the month-long fighting that tore the Greek capital apart in December 1944 and became known as the Dekemvriana. Earlier left-right clashes during the 1940s in Greece have been sanitized, and the wounds they opened have apparently healed. Are the Dekemvriana next? The December 1944 events were a turning-point in Greece’s troubled 1940s and, by extension, the country’s twentieth-century political history. 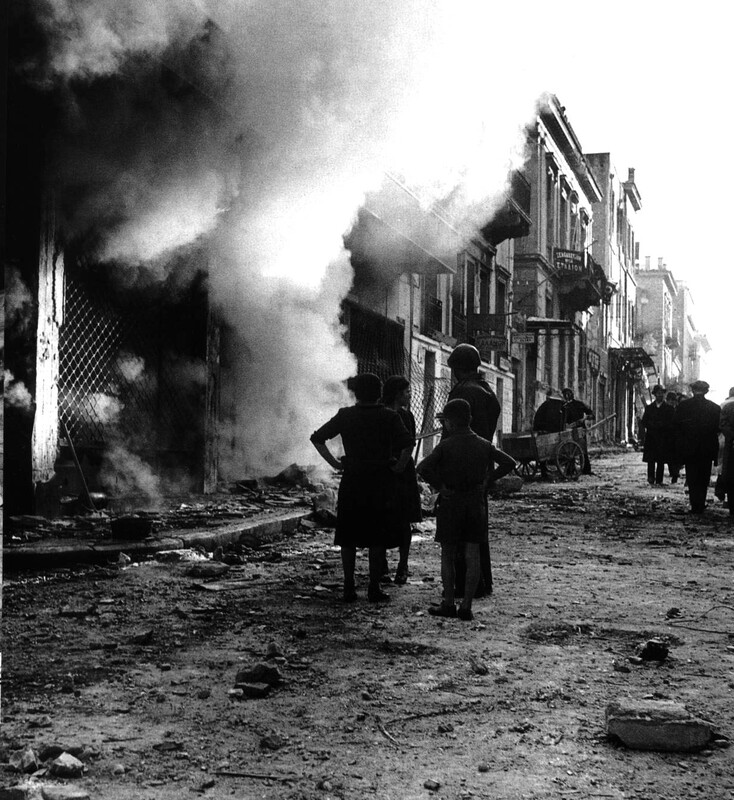 They marked the end of a brief, uneasy peace between the largest resistance group, the left-wing EAM (Ethniko Apeleutherôtiko Metopo, National Liberation Front), and the British-backed Greek government-in-exile that arrived in Athens shortly after the city’s liberation in October 1944. After the breakdown between EAM and the government in December, the hostility between left and right escalated precipitously (except for a brief truce in early 1945) and culminated in the Greek Civil War of 1947-1949. One of my earliest memories is of gaping with awe at bullet holes in several buildings around Syntagma Square, in central Athens. In some cases, the telltale pockmarks were neatly arranged around window-frames. As a child growing up in the Athenian suburbs, I found the bustling city center an exciting place, but nothing in it could ignite my childish imagination as much as those scars of war. Looking for them from the backseat of our family car certainly made going to the heart of Athens on errands less of a routine affair. The responses to my many questions—in between helpfully pointing out to my parents yet another bullet-ridden building—reflected the staunchly Anglophile and conservative sentiments that coursed through the veins of all the members of my family. The communists, so the story went, did not like the government that Greece had acquired soon after it was liberated from German occupation and started fighting against it. Thankfully, the British army, which helped to free Greece from its Nazi occupiers, fought and defeated the communists, who—the story continued—had killed many innocent civilians while trying to seize power. The communists then persisted in trying to overthrow the government despite their defeat in Athens, but a few years later they eventually gave up. I had no reason to disbelieve this account. It was even confirmed by my maternal grandfather, who was the most left-wing member of our family: he had voted for the Center Union party in the 1963 elections. The leader of that party, George Papandreou, had been the prime minister who the communists had tried to undermine in 1944. Years later, in 1974, during Greece’s transition from the colonels’ dictatorship to democracy, I gained access to an alternative point of view. The communist party’s legalization and the end of censorship were part of a process that spawned hundreds of left-wing accounts of the 1940s, in newspapers and book form. In these, December 1944 was called o matômenos Dekemvrês (bloody December), and the Dekemvriana were depicted as a month-long clash between, on the one side, the communist and popular-front forces that represented the people and, on the other side, the Anglo-imperialists and Greek reactionaries who represented the plutocrats. Bloody December began, according to these versions, after the victory of the reactionaries—who killed many innocent civilians—and was a prelude to the installation of a reactionary Greek government that served the interests of Western imperialists. This was a fascinating, alternative version of the December uprising; that it discredited so much of what went on during the dictatorship gave it, in my increasingly radical eyes, legitimacy over what I’d heard as a child. By that time, some of the pockmarked buildings had been pulled down or resurfaced. Some bullet holes were still in evidence, though, and I began to look at them in a different light. Moreover, just as the legalization of the communist left began to unleash a flood of counter-narratives about the Dekemvriana, I became a college student. My new status gave me access to academic investigations—some already in print outside Greece, and many part of a stream of scholarly works—on the history of Greece in the 1940s. The availability of British and US diplomatic archives relating to that period also fueled the outpouring of articles and books. The more scholarly and better-documented studies were, on the whole, revisionist, and they undermined the pre-1974 “official” story that blamed Greece’s internecine violence on the left’s “lust” for power. This was certainly the case for the events that occurred during the country’s wartime occupation; indeed, the contributions of the left to the resistance are now part of Greece’s officially revised history. Soon after it was voted into power in 1981, PASOK formally recognized the role of the left in the resistance to the German occupation, affording belated respectability to EAM/ELAS and, in the case of those still alive who had been members of the organizations, small pensions. It is important to note, however, that the official recognition of the left’s role did not entail condemning the role played by rightist resistance groups. Left and right indeed clashed during the country’s occupation, but no one wished to delve deeper into that; instead, all who were involved in the resistance were enveloped in a warm and fuzzy embrace of “national unity,” and this lêthê tou parelthontos (forgetfulness of the past) was touted as a means to ensure the consolidation of post-1974 democratic culture. After all, both sides had fought the German occupiers—at least some of the time. The Dekemvriana, however, passed almost unmarked; their sixtieth anniversary was hardly given any publicity by the Greek media, which maintained the practice of tacitly going along with the post-1974 spirit of national unity. At least there is now agreement, more or less, over basic facts. The clashes in Athens began after shots were fired against unarmed demonstrators taking part in a large, left-wing rally that was converging on Syntagma Square on December 3. No one is certain who fired, or gave the order to fire, those shots, but the consensus is that the perpetrators were either police or members of right-wing groups. The demonstration had been called to protest the Greek government’s demand that EAM demobilize its guerrilla army, ELAS (Ellênikos Laikos Apeleutherôtikos Stratos, Greek Popular Liberation Army)—a demand that several scholars have suggested was dictated by the government’s British patrons. EAM refused, citing the government’s disinclination to disarm the militias that had collaborated with the Germans and that posed a serious threat to EAM and its supporters, which could have become deadly as soon as ELAS turned in its arms. While the aftermath of the murderous attack against the unarmed demonstrators is still being debated, what happened on December 3, 1944, is now clear. EAM unleashed local ELAS forces against the British and Greek-government forces. Both sides fought with particular ferocity and did not discriminate between combatants and civilians. Winston Churchill sanctioned heavy British involvement that decided the outcome. His instruction to the British military commander in Athens achieved instant notoriety: “…do not hesitate to act as if you were in a conquered city where a rebellion is in progress.” The British forces followed those orders, and so did the combatants on both sides. The fighting ranged from street battles to aerial bombardment by the British, whose air power, in fact, contributed to ELAS’s defeat, which Churchill marked by making a brief trip to Athens on Christmas eve, risking his life. A plot to blow up the Grande Bretagne, the hotel in Syntagma Square where he was staying, almost succeeded. Still, the causes of what happened remain in dispute, and lingering, deep differences are likely to be around for a while. The “external factor”—namely, Britain’s direct intervention—is generally accepted as a crucial element in rescuing the government’s forces and supporters from quick defeat during the post-December 3 clashes, irrespective of British motives (imperialist for some or democratic for others). The roles of the two major domestic actors remain controversial. Of course, no one has actually bothered to analyze the then-recently returned government’s actions: it is tacitly accepted that it did all it could both to address the left’s challenge and to stay in power with the help of the British. As for the role of the communists, there is no end to the exchanges. Explanations of their choice to take up arms after December 3 have ranged from near-justification to near-condemnation. The main views fall into three broad categories. The first consists of “sympathetic” explanations that represent EAM/ELAS’s actions as a misjudged, reluctant, or unplanned bid to seize power through armed means in the context of a breakdown of law and order. (An even more charitable account offers the view that EAM’s design was not to seize power but to improve the left’s bargaining position.) A second theory is a more “structural” interpretation that suggests EAM’s power bid was a reaction to a climate of escalating uncertainty and insecurity. Finally, a post-revisionist school is now revisiting the issue of a communist plan to seize power, by force if necessary. There are, of course, commentators from both sides who would like the differences between the antagonists who pitched themselves against one other in Athens during December 1944 to be swept aside. The authorities could then construct yet another platform on which to promote national unity. But that would involve either a collective repudiation of Britain’s and the Greek government’s role, or a blanket condemnation of EAM/ELAS. By the looks of things, however, it is going to take much more than the passage of six decades for that kind of consensus. For now, it seems that the popular and utilitarian post-1974 motif of unity through memory simply does not apply to theDekemvriana. Alexander Kitroeff teaches history at Haverford College and is a contributing editor to greekworks.com, which published his most recent book, Wrestling With the Ancients: Modern Greek Identity and the Olympics. Αναρτήθηκε από ΔΗΜΗΤΡΗΣ στις 9:31 μ.μ. hans some 22 Μαρτίου 2018 - 3:40 π.μ.